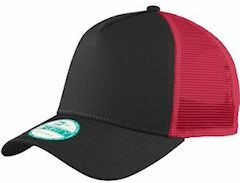 Embroidered Caps, Trucker Caps, Mesh Back and Flat Billed caps. Custom Embroidered Trucker, Mesh Back, Flat Billed, Carhartt and High Profile Caps. 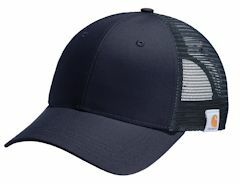 Custom embroidered Carhartt Truck cap caps, embroidered mesh back cap caps, embroidered flat billed cap caps and embroidered high profile cap caps. Custom embroidered with your company logo or customized design. Embroidery cost are included in the costs below. Brands such as Port Authority, Sport Tek and New Era among others! 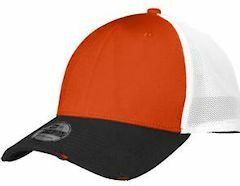 Check out our custom embroidered Carhartt trucker caps, mesh back caps, flat billed caps and high profile caps below! 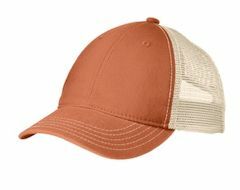 Incredibly soft mesh and enzyme-washed twill make this laid-back cap comfortable day in and day out. Fabric: 100% cotton twill front panels, 100% polyester mesh mid and back panels. Structure: Unstructured. Profile: Low. Closure: 7-position adjustable snap. Custom embroidery included. 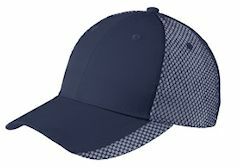 The two-tone color adds character to this ultra breathable mesh cap. Fabric: 80/20 poly/cotton twill in front two panels and bill; 100% polyester mesh in mid and back panels. Structure: Structured. Profile: Mid. Closure: Low-profile hook and loop with buckle. Custom embroidery included. 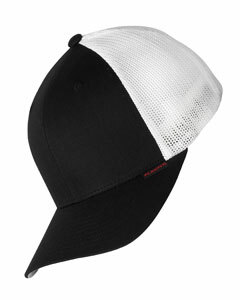 Contrast visor edging, piping and a double visor effect give this breathable cap a sporty look. Fabric: 100% cotton twill front panels, 100% polyester mesh mid and back panels. Structure: Structured. Profile: Mid. Closure: Hook and loop. Custom embroidery included. 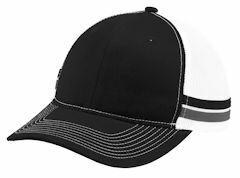 Custom embroidered 6511 Yupoong Flexfit® 6-Panel Trucker Cap . 55% polyester, 43% cotton, 2% spandex; 6-panel, structured, low-profile; eight-row stitching on bill; hard buckram backed front panels; polyester/spandex mesh on side and back; spandex sweatband retains shape; Silver underbill. Custom embroidery included on front at no extra charge. 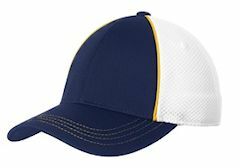 Soft, breathable mesh combines with contrast piping and stitching to give this cap a sleek, clean and sporty look. Fabric: 100% polyester mesh in front two panels; 100% polyester closed-hole mesh in mid and back panels. Structure: Lightly structured. Profile: Low. Closure: Low-profile hook and loop.Custom embroidery included. 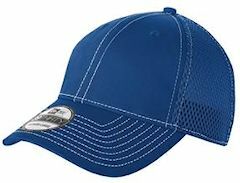 You'll look cool--and stay cool--in this adjustable cap with mesh panels for ventilation and a contrast front. Fabric 100% cotton in front two panels; 100% polyester Spacer Mesh in mid and back panels. Structure Structured. Profile Mid. Closure 7-position adjustable snap. New Era products may not be resold without embellishment. Custom embroidery included. This 5-panel cap has mesh mid and back panels for superior ventilation and a trend-right snapback closure for an easily adjustable fit. Fabric: 100% cotton twill front panels and bill; 100% polyester mid and back panels. Structure: Structured. Profile: High. Closure: 7-position plastic snap back. 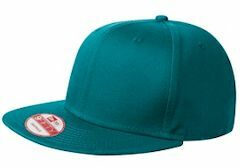 This style has an urban attitude thanks to the iconic flat bill and old-school snapback closure. Fabric: 100% cotton. Structure: Structured. Profile: High. Closure: 7-position adjustable snap. This modern cap evokes the look of a bygone age with worn-in details and breathable mesh. Fabric: 100% cotton twill front panels and bill; 85/15 poly/spandex mesh mid and back panels. Structure: Structured. Profile: Mid. Closure: Stretch fit. 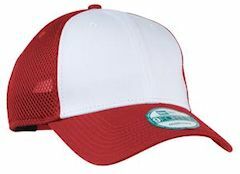 Embroidering the sides and back of caps is one of the latest trends in headwear. Many of our customers include their website URL on the back, which attracts people's attention both coming and going. Prices below are in addition to the cap prices listed above under each cap style. Prices per location. Contact us for more information. 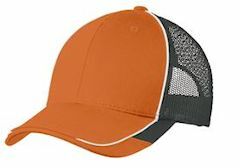 We are not able to embroider on the backs of visors nor the straps or bill of the cap. Costs are based on text only. Quantity is based on same text on all pieces. For example: If you wanted personalized names, your price would be the 1-2 piece pricing. If a website URL, same thread color on multiple items, you would combine items for discounts above. If you would like a logo embroidered on the side or back of your cap, please send your artwork to us for an accurate quote.